Raphael is in his second year--the novitiate year--with the Province of St. John the Baptist. He is from Lagos, Nigeria, where his parents live and have been living since before he was born. Raphael explains that in Nigeria, a person's hometown is where his or her family comes from ancestrally (i.e., for several generations). In his case, his hometown is considered Enugu, Nigeria, as that is where his ancestors come from and it's where his native Nigerian language (Igbo language), originates. Raphael has his undergraduate degree in general biology from Baylor University and he completed the Medical Laboratory Science program with Houston Methodist Hospital at the Texas Medical Center. 1) What attracted you to the Franciscan order? I think my discernment began when I began praying the Rosary daily. I had recently consecrated myself to Jesus through Mary. The more I prayed the Rosary, the more I wanted to pray. By praying the Rosary daily, I learned to listen to the Sacred Heart of Jesus through the Immaculate Heart of Mary. As I meditated on the mysteries of the Rosary, I had an increasing desire to follow in the footsteps of Jesus more closely in my daily life. Prayer opened my heart to God and helped me surrender myself totally to Him. With the help of Our Blessed Mother, I was increasingly and fervently drawn to the Blessed Sacrament and to all that is holy and sacred. Through prayer in this manner, I began to observe that the Lord was calling me to follow him as a Franciscan. 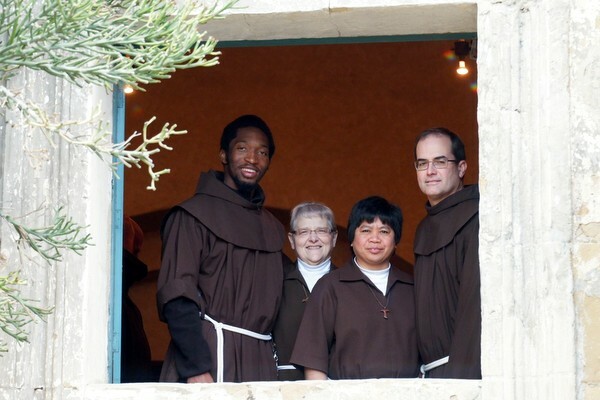 I read the lives of the Saints (a lot) and I found the Franciscan saints most inspiring. Their simplicity, their charity, their humility, their prayer and the Franciscan charism filled my heart with a burning and sometimes impatient desire to join the brotherhood. The desire of Francis and his brothers to follow the Lord and to serve the poor resonated well with my desire to follow the Lord and to serve the poor. So, unlike many others who join, my first encounter with the Franciscans was not by meeting another friar. As soon as I met one, I was sure I wanted to join. We typically begin our day here with morning prayer at 7:15 a.m. On some days we have Mass after morning prayer. On other days we have Mass later in the day. From Monday to Wednesday (and sometimes on Fridays) we usually have classes in the morning and then either house work or integration (quiet time) in the afternoon. On Thursdays, we are sent out to different centers where we minister. I am assigned to minister at a senior/assisted-living center run by the Daughters of Charity of Saint Vincent de Paul. In the morning, I help them resolve any issues they have with their phones and computers. In the afternoon from 1-3 p.m., I entertain with live music or karaoke. I do this together with another novice who is also assigned to the same center. From 3-5 p.m., we go on house visits--visiting the seniors in their apartments and chatting with them. On Saturdays we go to Mass, perform our house chores, and are free until 9:15 p.m., when we have to be back for night prayer. On Sundays, we go to Mass and are generally free until 2 p.m. From 2-5 p.m., we are to observe silence in the novitiate. We have evening prayer at 5 p.m., followed by a light gathering with the solemnly professed friars here at Old Mission Santa Barbara. We have dinner shortly afterwards. On Sundays, dinner is made by the novices (not everybody’s favorite activity!). 3) What are your future plans? In the near future I hope to begin studies for the priesthood. After that, only God knows. 4) Who's your favorite saint and why? My favorite saint is Our Blessed Mother. It is through her that I have come to love the Lord more deeply and to walk closely with him. In the Franciscan tradition, my favorite saint is Padre Pio. I admire his desire to be led by God to minister to his sheep. He surrendered himself to God without reservation. I desire to do the same with trust. 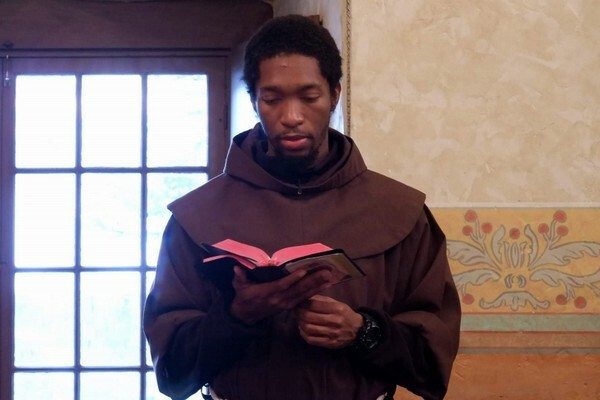 Please keep Raphael and all of our postulants and novices in your prayers! Are you discerning a call to religious life? Visit the Become A Friar page on our provincial website. Vocations Director Br. Tim Lamb can help you in your journey. Contact him at becomeafriar@gmail.com or 513-218-3547 (texting is fine). Want to keep up with the Novitiates throughout the United States? 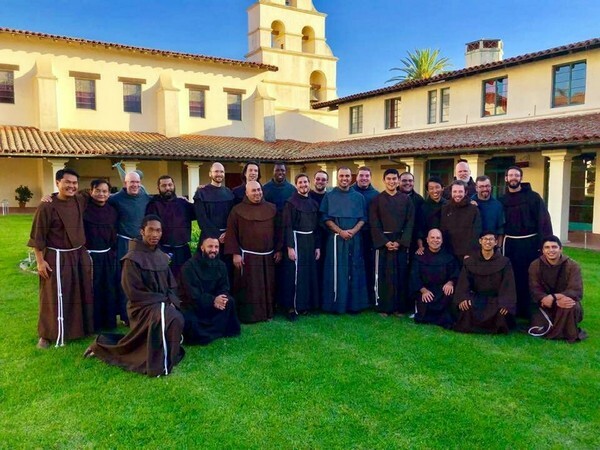 Their Facebook page, Franciscan Interprovincial Novititate - Old Mission Santa Barbara, has the latest news.